At nine, Jordan he entered the Juilliard School of Music Pre-College Division for classical piano training, but by his late teens he had grown increasingly interested insynthesizers and progressive rock music. Against the counsel of his parents and tutors, he turned away from classical piano and tried his hand as a solo progressive rock keyboardist.After performing in various projects during the 1980s, he gained international attention in 1994 when he was voted “Best New Talent” in the Keyboard Magazinereaders’ poll after the release of his Listensolo album. Two of the bands that took notice of Rudess were The Dixie Dregs and Dream Theater, both of whom invited him to join. Rudess chose the Dregs, primarily as being a part-time member of the band would have less of an impact on his young family. During his time with the Dregs, Rudess formed a “power duo” with drummer Rod Morgenstein. The genesis of this pairing occurred when a power outage caused all of the Dregs’ instruments to fail except Rudess’, so he and Morgenstein improvised with each other until power was restored and the concert could continue. The chemistry between the two was so strong during this jam that they decided to perform together on a regular basis (under the name Rudess/Morgenstein Project or laterRMP) and have released a studio and a live record. RMP will undertake a short U.S. tour in November, 2013. Before joining Dream Theater in January 1999, Jordan connected with John Petrucci and Mike Portnoy of Dream Theater, bassist Tony Levin of King Crimson and Peter Gabriel notoriety, and recorded two albums with “Liquid Tension Experiment.”Rudess has been the full-time keyboardist with the grammy nominated progressive metal band, Dream Theater, since the recording of 1999′s Metropolis Pt. 2: Scenes from a Memory. He has recorded seven other studio albums with the group: 2002′sSix Degrees of Inner Turbulence, 2003′s Train of Thought, 2005′s Octavarium, 2007′sSystematic Chaos, 2009′s Black Clouds & Silver Linings , A Dramatic Turn of Events as well as their newest album, Dream Theater. In addition, he has appeared on the live albums and DVDs Live Scenes From New York, Live at Budokan, Score, Chaos in Motion and Live at Luna Park. In addition to working with Dream Theater he occasionally records and performs in other contexts, such as a 2001 one-off duo performance with Petrucci (released as the CD An Evening With John Petrucci and Jordan Rudess), as well as backing up Blackfieldon their first short US tour in 2005 and playing a solo opening slot for them on their second in 2007. He also contributed to Steven Wilson’s 2011 album, Grace for Drowning. In 2013, Rudess joined with bassist, Tony Levin, and drummer, Marco Minneman, to create a new supergroup, LMR. 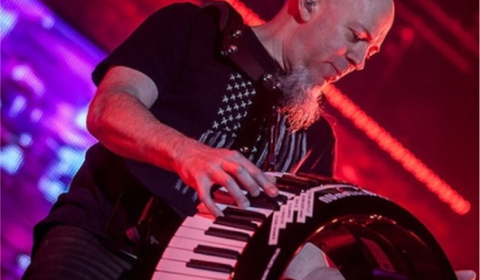 In 2010, Rudess composed “Explorations for Keyboard and Orchestra,” his first classical composition. It was premiered in Venezuela on November 19, 2010 by the Chacao Youth Symphony Orchestra and guest conductor Eren Başbuğ. Rudess played all of the keyboard and synthesizer parts. A full symphonic recording of Explorations will be released in December, 2014 played by Poland’s Sinfonia Consonus.On July 28, 2011, in a poll conducted by MusicRadar, Rudess was voted the best keyboardist of all time.